For 33 years Bruce Schwoegler was a top-rated broadcast meteorologist and science reporter on WBZ-TV. He was part of the long-running Eyewitness News team along with anchors Jack Williams and Liz Walker and sportscaster Bob Lobel. That entire team is in the Massachusetts Broadcasters Hall of Fame. 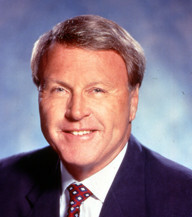 Throughout his career Bruce honed an ability to simplify and teach complex technological issues to a broadcast audience and others. He won New England’s first Emmy Award for Outstanding Meteorologist and is the recipient of numerous honors including recognition for a prime-time Global Warming television special and the American Meteorological Society (AMS) National Outstanding Broadcast Meteorologist Award. Throughout his career, he honed an ability to simplify and teach complex technological issues to a broadcast audience and others. He won New England’s first Emmy Award for Outstanding Meteorologist and is the recipient of numerous honors including recognition for a prime- time Global Warming television special and the American Meteorological Society (AMS) National Outstanding Broadcast Meteorologist Award. He became interested in weather as a career in his early university years. During summers, he worked in the airport tower at Milwaukee’s Mitchell Field. Prior to his entering broadcasting, Schwoegler was a U.S. Naval lieutenant working in meteorology and oceanography in Alaska, the North Pacific, Florida and the Caribbean where he also assisted with “Hurricane Hunter” operations. New York’s McGraw-Hill Company published, Weather and Energy, Schwoegler’s first book which received accolades for excellence in renewable energy education Simultaneously, three years as an environmental columnist at United Press International were followed by a decade at a similar post for The Associated Press. His syndicated cartoon/ column, “Weatherwise and Otherwhys,” has been printed worldwide. At Boston University, Professor Schwoegler assisted in the creation of school science curricula. He has also served on the AMS Board of School and Popular Meteorological and Oceanographic Education. Boston’s Museum of Science nominated him to a six-year term on its Board of Overseers, and for five years, he presented monthly Museum of Science weather/climate/science programs. Several years earlier, he had created and presented Boston’s first inner-city youth science summer series and conducted a total of 1,000 weather program appearances at elementary, high school and college classes. As a business leader, he was the founder and Chief Technology Officer for MySky Communications and was the developer and principal scientist on a team creating “MySky,” a unique, location-specific weather application for which a 2002 US Patent was granted to him. Several major companies purchased rights to technologies he created at MySky. Bruce has been a consultant to the National Geographic Society, Weather Services Corporation, Thermo Electron Corporation and Weather Services International. Expert environmental testimony in legal proceedings is another aspect of his talents. Internationally, he has worked with scientists from many countries who are researching environmental impacts of the Soufriere Hills Volcano on the Caribbean island of Montserrat and nearby environs. In 2010, Bruce headed a multinational scientific group sailing catamarans from Tahiti to distant/remote islands and atolls while examining Earth and space sciences including a total solar eclipse. Schwoegler graduated from the University of Wisconsin with a double major BS degree in Atmospheric/Oceanic Sciences and Naval Science. Graduate work continued during his military service.